​From the small country of Panama came one of the greatest boxers the world has ever known. Roberto Duran was born in El Chorrillo in 1951 and would grow up to be a four division world champion and boxing hall of famer. He would forever leave an impact on the sport and put his country on the map. ​Duran turned pro in February of 1968, at the age of 16. He would win that fight, and go on to win his next 31 fights, most of which took place in his native Panama. He fought at Lightweight and in that time would make a stop, at the age of 21, to fight Ken Buchanan for the WBA lightweight title at the most famous Arena in the world, Madison Square Garden. During this fight, Duran would formally introduce himself to the world, by winning his first of many titles and showing off his incredibly punching power. The same year Duran would lose his first title and fight to Esteban De Jesus, which he would avenge two years later in a rematch. ​For the next ten years Duran would stay atop the division, Unifying titles, until he decided to move up and challenge for the WBC welterweight belt, in 1980, against the undefeated American, Sugar Ray Leonard. This would be Duran’s most famous and impressive victory, as he beat Sugar Ray up from bell to bell. Duran showed the world that his brute force and fighting style was superior to the beloved Leonard’s speed and flashiness. He would become the best fighter in the world. ​5 months later, in the rematch, Duran would be part of another famous fight, the “no mas” fight. Duran quit in the middle of the eighth round, in a fight he was losing to Leonard, by telling the ref “no mas” (no more). Many stories have been told about why Duran stopped the fight. From stomach cramps to exhaustion to just being frustrated with the style and show that Leonard was displaying that particular evening. It would haunt Duran for the rest of his life. ​Duran would win and lose some more in the 1980s, winning a title in a third division by knocking out Davey Moore for the WBA super middleweight title. In his very next fight that year (1983) Duran would lose a hard fought decision against one of the greatest Middleweights of all time, Marvelous Marvin Hagler. His next fight after that would be another loss, back down in weight against Thomas Hearn’s. ​Even in defeat, Duran was still attempting to fight the greatest fighters of the era, regardless of weight class. He cemented himself as one of the “Four Kings” of boxing, a group of fighters consisting of himself, Leonard, Hearn’s & Hagler. They were the best of the best, strewn across weight classes, all meeting in the ring to prove who the best was. Duran was the lightest, which never even entered his mind. He took each one on, and established himself as one of the best ever. ​Duran would eventually become the middleweight champion of the world by defeating the extremely talented Iran Barkley in 1989. It was Ring Magazines “Fight of the Year” and it made Duran only the 3rd fighter to ever win titles in four weight classes. ​Roberto Duran would keep fighting into the 90s, taking on fighters like Vinny Pazienza, Hector “Macho” Camacho and William Joppy. His last fight took place in 2001 against the Hall of Famer Camacho. It would be Duran’s 119th fight. A career that spanned five decades. He fought his first fight in 1968 and his last in 2001….33 years. ​The man known as “Manos de Piedra” (Hands of Stone) would compile a records of 103 wins, 16 losses and 70 of his wins coming by way of knockout. He rose from extreme poverty in his native Panama to become the first man to ever beat Sugar Ray Leonard. His legacy will always be cemented as one of the greatest fighters ever. In 1999, the Associated Press rated him as the greatest lightweight and the seventh greatest fighter of the century. Ring Magazine would later name him also as the greatest lightweight ever and the 5th best fighter of the past 80 years. Duran would be inducted into the International boxing hall of fame exactly 5 years after his retirement in 2007. 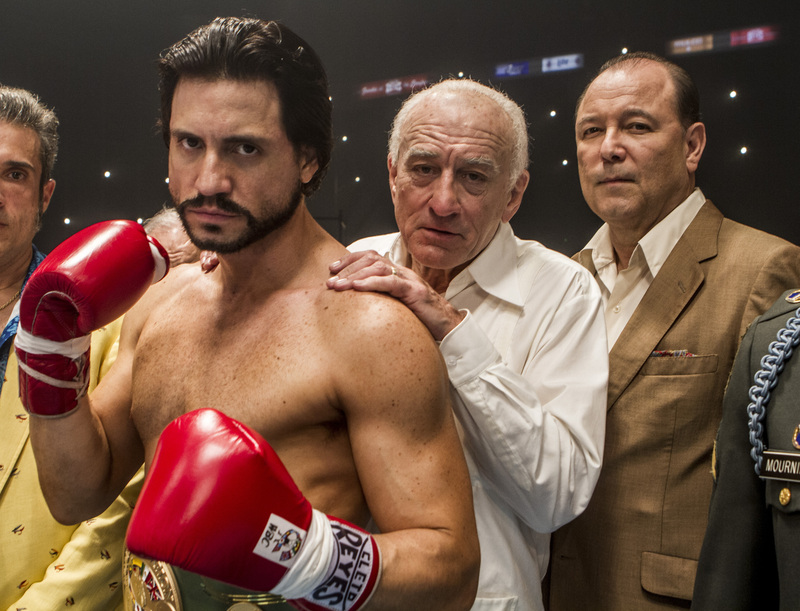 ​On August 26th, a biographical film will be released about the life of the great Roberto Duran called, fittingly enough “Hands of Stone”, Edgar Ramirez will depict the great champion, as well as Robert DeNiro as Ray Arcel and Usher Raymond as Ray Leonard. It is a film that will need to fit a lot of information into a small time frame. Fifty years of fighting and historical boxing moments. One thing is for sure, they couldn’t have picked a better figure in the sport to make a movie about.